Newsday: Greg Logan has an article on Doug Weight on what went wrong last season, how he feels he can contribute to this team, the young players on it and why he decided to sign here. All I know is a year ago Doug Weight reported to the St Louis Blues a fifty point player. If he had a poor season because of the circumstances around him or how he was used by the coaches in St Louis and Anaheim that's fair enough but on this team he has to contribute on the score sheet and make plays to score or setup goals that the departing players did not provide or his acquisition will not work out. CBC.com: Marc Crawford had some comments about the new crop of NHL coaches hired over the summer and felt Scott Gordon's Islanders could surprise. Montreal Gazette: Dave Stubbs reports Boston in it's first preseason game Monday won 8-3 against the Montreal Canadians in a physical game keyed by a huge return by Patrice Bergeron and Manny Fernandez. These teams played a seven game playoff last spring with first seed Montreal beating eighth seeded Boston. Islanders website: Report the Islander rookies defeated the UNB 4-1 in a scrimmage with three shorthanded goals. Matt Martin and Justin DiBenedetto––both drafted by the Islanders in 2008––along with Sting alumni Mike Haley and Vladimir Nikiforov each notched goals. Kevin Poulin allowed only one goal on 23 shots. Sound Tigers head coach Jack Capuano and Pro Scout Tim Maclean comments on how the club played. UNB Website: Should have an update on tonight's prospect game at some point. The Guardian: Jason Simmonds reports Islander officials were in Summerside on Monday in preparation for Thursday and Saturday’s games with comments from Islander assistant Kerry Gwydir. CBS Sportsline: Wes Goldstein Monday had a conference review that was basically worthless beyond telling our fans about Rick DiPietro's contract and management doing things differently. Tell us the club cannot score enough or it's not skilled or too injury prone, not about the all-star goaltenders contract or management structure and I would write that's fair enough. This was just thrown together and lazy. Islanders website: Scott Gordon talks a lot more about how the players are adapting to his new system and what it will take from them as a group for it to work on the ice while strength and conditioning Coach Chris Schwarz has made some adjustments in training to address what the coach is doing on the ice. Sound Tigers.com: Has interviews with Kurtis McLean and Chris Lee. Again, I love what Scott Gordon is trying to do with what he has to work with because the Islanders team speed is one of the basic flaws with this roster but it will come down to if this group of players are capable of playing this kind of hockey of if they will buy-into it? What Scott Gordon has not addressed or mentioned is how he will get more goals from overspeed because you cannot teach hands or scoring skills and to this point a lot of players on this roster have not demonstrated they can score enough to play in a teams top six forwards which is where your goals must come from. My guess is here the first test of the working relationship between coach and general manager will be when a veteran wants to do what he does best and play as he always has while the coach wants him playing his system vs when someone can play the system but not score enough to keep a spot. What was it Al Arbour told Bill Torrey when he has a choice of Dwight Foster or Micheal Bossy? " Get me the home run hitter "
Different times but the same basic theory applies. 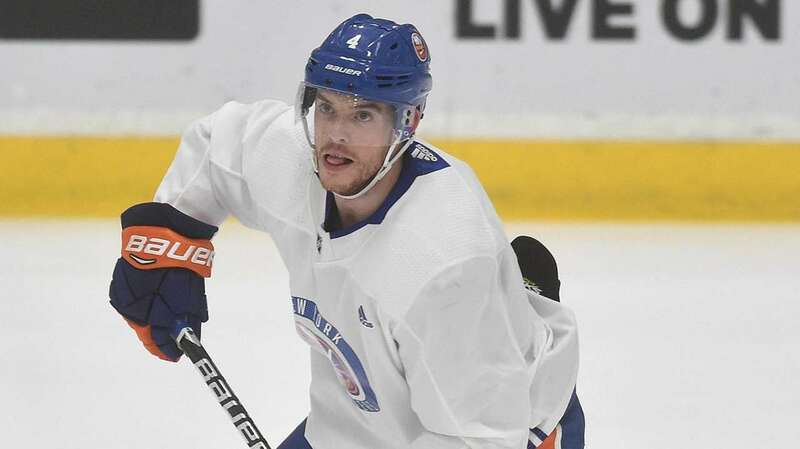 Newsday: Mark Herrmann has an NHL column that includes Bruno Gervais comments on former teammate Richard Zednik who is returning to play with the Panthers.